Wide toughened glass working top. Stainless steel drip tray, aluminum mixing tube. Easy to clean, stain resistant. 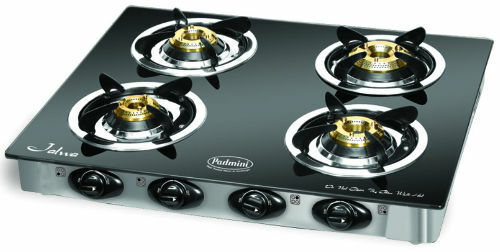 Padmini 4 burner Gas stove- CS4GT CLOUD PLU is equipped with international stainless steel frame-brush finish, making it elegant and robust. It comprises of wide toughened glass working top. The stove has high efficiency brass burners and individual pan support. It has manual ignition and 360 rotational inlet nozzle along with robust Stainless steel drip tray and aluminum mixing tube. It is easy to clean this stove as it is stain resistant.